Nothing makes me feel more content than being out in nature. I want to be able to put a name to every wildflower, every tree, every bug, every rock formation and since living in the desert, every cactus that sits along the paths I walk or drive. Did you know there are over 1,500 species of cacti? Finally, I settled on learning to identify and name birds. North America only has about a 1,000 of them. Of course, that’s only about a tenth of the species world-wide. I’ve managed, since 1999, which includes nine years of full-time travel across this country, to see a bit over half of them. And a bit of travel to distant lands has added about 200 more to my life list of birds. The boobies, which are among the latter, are some of my favorite birds. And seeing them for the first time was magical. The red-footed beauties came first. There were hundreds of them, and I gasped in delight as I watched them, from a walkway above a sheer cliff, circling in flight as they headed out to fish in the Pacific Ocean. I was at a bird sanctuary on Rota Island, just 35 miles north of Guam, where I was visiting my daughter, Trish. She had treated me to a flight to the island after I had been so disappointed about the lack of birds on Guam. The birds there had been decimated by the brown tree snake, a non-native invader. On Rota, where there were none of these nasty snakes, birds were everywhere. From my high perch, and lower down on the cliff than the red-footed nests, I spied a few brown boobies, whose feet are yellow. It was a grand day to remember. 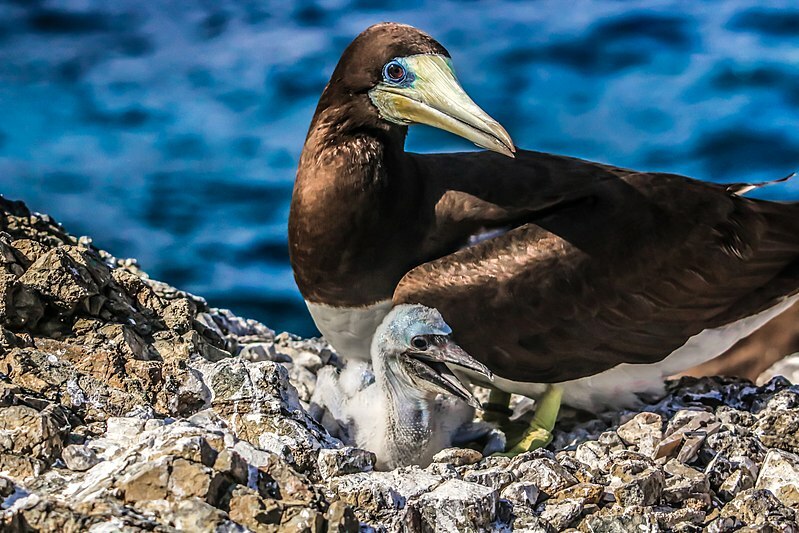 Just as grand was the day I danced with a blue-footed booby, my favorite of the three boobies. 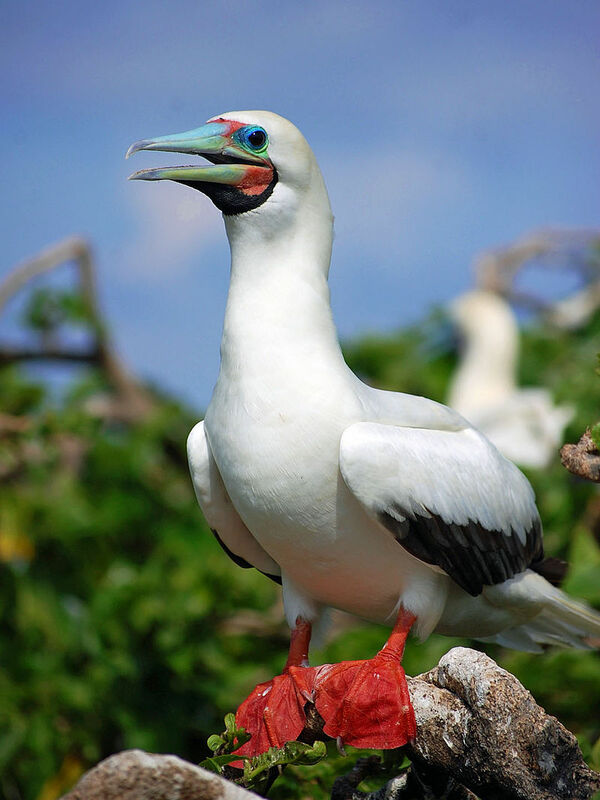 I saw hundreds of these birds when I cruised the Galapagos Islands in a 16-passenger catamaran. We had along an official guide, which let us visit places where larger groups were not allowed. It was a birder’s paradise, as here the birds had never experienced human predation, and so weren’t afraid of us. A hooded mockingbird landed on my shoe one day. And on another I was kissed by a baby seal as I stepped off a small raft and onto the island, The touch made me feel special, unlike the next lady onto the island. That same small seal decided to see if she tasted good. The rule for us humans was we couldn’t touch the animals, but there was no rule about them touching us. My dance with the blue-footed booby happened when I came across the large bird blocking my way along a narrow path. He lifted one-foot and then the other to show off his blue feet, which how the male boobies court females. I lifted one foot and then the other in response. We both repeated the motion several times until our guide came around the corner. Stop teasing the booby,” he said. Bean Pat: A Woman of Worth https://tinyurl.com/y825f58s Telling HerStories: The Broad View is sponsored by Story Circle Network, which is an organization that supports female writers. I’m a member and it is the best support I’ve ever had as a writer. You would have enjoyed it. But it was the blue-footed booby I danced with. I don’t know if the red foots dance. 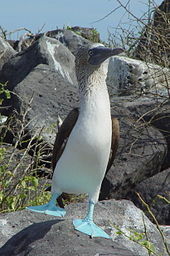 The brighter blue the male blue-footed booby’s feet are, the more likely is he to find mates. And what female would pass up going dancing. Thanks for commenting Pit. It sort of feels like we are old friends by now. good friends, then it is. …but don’t you step on his blue suede shoes! 🙂 What a great story – you gave me a smile today. And by saying that you made my day brighter Diane. Thanks.